We have just returned from a long weekend on the Isle of Man. It is one of our favourite destinations, although it shares much of the wet climate of north Lancashire and neighbouring Cumbria, being seventy miles from the connecting port of Heysham. My own initial reactions were: its a fascinating design, suggesting independence, with an almost ‘engineering’ feel to it; it’s not something I’d want on my wall as it’s a ‘hard’ image; the ‘threeness’ of it really stands out and hits you… there are many more, and it is useful to let the imaginative side of the mind just play like this. The three legged symbol of Mann (as the Manx people traditionally write it) is undoubtedly inspired by the Celtic triskelion. There are many examples, which have a common form of a ‘leg’ in the shape of a spiral or knot – one of the favourite forms of the Celts. Threeness is a very old concept, and fundamental to the world’s philosophical systems, as well as being an icon of stability. The equilateral triangle is often used to denote threeness, which can be point up or down. When it’s up, it usually indicates the ‘coming into being’ of a single point of power or will which seeks the diversification of manifestation to make the ‘garden below – creation’ a rich one. The one gives rise to the two, which are polar aspects of the one, though very different, and therefore inseparable. The Great Pyramid of Gizeh is an example of a three-dimensional triangle with a very special set of properties. As Pythagoras would have attested, all triangles are very potent forms. 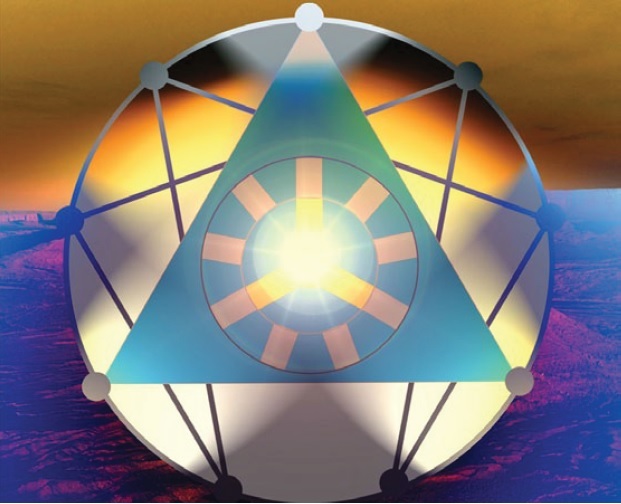 Within the triangle, ‘polarity’ becomes the cornerstone of creation; and the different natures and relationships set up between the parts of ‘that which was and always will be One‘ weave the world or sub-world we see and in which we have our daily being – below’. A better way of thinking of all this is inner and outer; where the inner is the most powerful and causative, but less detailed; and the outer is the result–in all its multiplicity. The great mystical secret behind this statement is at the heart of what the Mystery Schools, such as our own Silent Eye, teach. When we amend things in the outer, we are dealing with traditional cause and effect. To amend things on the inner is the basis of so-called esoteric magic. Because the one that becomes two introduces differentiation, intelligent diversity has been created, and the creation can move on. All this is set within a circle – a traditionally solar symbol whose centre of activity is the centre of that circle. We can see that the three-legged Isle of Man symbol is based on a circle at whose centre is the intersection of the three centre lines of the figure’s legs. This is usually missed, but is a key aspect of the design. So the One wills the continuation of the creation and the two that was one is therefore three, becoming four as the stability of this process is established and the Work proceeds in its unfolding. But the symbol of Mann, above, is subtly different from the traditional Celtic treskilion. The traditional spiral of the triskelion is here replaced by actual legs; showing that this refers not to some ‘cosmic’ force, but to Mankind. The triangle is there – look at where the tips of the feet are pointing and you’ll see it. This time, unlike the triskelion, the triangle is point-downwards, though the whole design is slightly offset from the vertical. The first image – the commercial logo that I’ve used as a simpler example, uses a different offset, which may be a legal requirement from the Manx government. One reason for the offset may be that the design clearly implies movement. Something is ‘whirling’ – but running under is own ‘steam’. A perfectly vertical triangle would be a symbol of perfection, but the world isn’t perfect, it is ‘coming into being’ constantly, ‘unfolding’ is the world we use in the Silent Eye School. The symbol therefore incorporates the idea of the process of evolution, driven by the creative forces embedded in the three-legged world, whose human image indicates that there is a ‘man/woman’ doing this! Not just any man/woman, but the generic human, of which we are all an instantiation – a living soul made from a spiritual and organic blueprint. In doing this we fulfil what Sue referred to in an earlier post concerning the text of Genesis. There is only so much you can show in one simple symbol! Armed with the above knowledge, we can take things deeper and draw two triangles over the core Legs of Mann image like this. I’ve rotated the original to align the circular core to the vertical. To my mind, this shows that the creators of the original figure, which was first recorded in the 12th century, understood very well that things proceeded from the inner. The two triangles – made from the toes and the thighs of the figure, superimpose to form a very special symbol called the hexagram. Here, the central figured is a Gorgon – the snake headed creature from Greek mythology, who had the power to turn ‘men’ into stone… but that’s for another day! Stephen Tanham is a director of the Silent Eye School of Consciousness, a not-for-profit organisation that helps people find the reality and essence of their existence via supervised correspondence courses. Images: Taken by the author and copyright unless otherwise stated.